Ok, there are now only 90mins until the first race of this year's Festival. 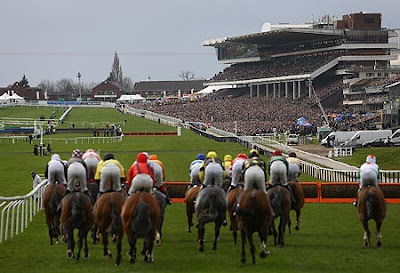 The roar from the crowd when the Supreme Novices' Hurdle starts the four-day festival is one of racing's great thrills. Have I got any winners lined up? Not a clue. Can't remember ever not copping a battering during Cheltenham, so I'll take it fairly easy I think.... but that's easier said than done and I'm sure I've said that before. It's the old saying, bet within your means, and make sure it's still fun. You're allowed to enjoy the moment rather than take it completely seriously once in a while. Whatever you do this week, good luck and make sure you shop around for the best prices and offers! It would be absolutely awesome if you could show your support and maybe post a short message and link on your blog?